For the past eight years, the Financial Executives Institute of the Philippines (FINEX) in partnership with JP Morgan Chase & Company have organized finance competitions amongst the colleges and universities in the Philippines to emphasize the importance of finance in a global environment. 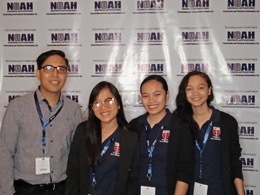 An elimination round was held simultaneously all over the country on 26 October 2018 in seven places: JP Morgan at Taguig City for the National Capital Region, the University of San Carlos for Central Visayas, and other venues spread across the Philippines to serve the other regions. In total, there were 92 entrants to the competition in 2018, and Team UP Cebu finished as one of the Top 20 qualifiers nationwide. On 23 November 2018, three representatives of the Junior Financial Executives (JFINEX) – UP Cebu Chapter went to Manila with their coach to participate in the 20th Inter-collegiate Finance Competition’s final round at the Assembly Hall of the Bangko Sentral ng Pilipinas (BSP), Malate. Twenty universities from all over the country, such as the University of the Philippines (UP) Diliman, UP Visayas Ilo-ilo, Ateneo de Davao University, De La Salle University-Manila, and University of San Carlos to name a few, met at BSP to compete. The B.S. Management students who represented Team UP Cebu were Sheena Mae Bajar, Trishia Ann Marie Simon, and Mary Rose Telamo. The coaches who helped them prepare for the competition were School of Management (SoM) Professors Rhenozo Barte and Stevenson Yu. Team UP Cebu finished 8th place. (Left to right) Coach Prof. Rhenozo Barte, BS Management students Mary Rose Telamo, Trishia Ann Marie Simon, and Sheena Mae Bajar. The FINEX in partnership with JP Morgan Chase & Company sponsored the airfare and lodging of Team UP Cebu and Coach Barte, while the SoM covered the other incidental costs. this? IE nonetheless is the market chief and a huge component to other people will miss your magnificent writing due to this problem.